Get an early start to your day and witness the spectacular sunrise over Uluru. This tour begins approximately one hour before sunrise and offers a complementary hotel pickup. 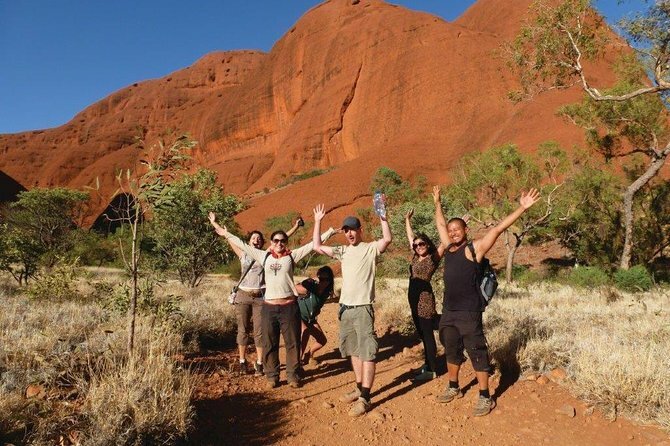 After the sun rises over the Uluru National Park, you'll then discover the culture of the Anangu people during a Mala Walk with an indigenous guide. You will also visit the Cultural Centre before being dropped back at your accommodation. This tour is a shared experience and can accommodate up to 24 people per group. The duration of this trip lasts approximately 4-hours. You will begin your early morning adventure one hour before sunrise, with a free pickup from your hotel or accommodation. Your tour guide will drive you to the base of Uluru where you will start the day with a walk around the 600 million year monolith while the sun begins to rise. This world famous icon has a lot to offer and is best experienced by visiting the different significant sites along the way. A guided cultural walk with a local indigenous guide will immerse you in the fascinating history and culture of the place. Don't fret, there will be enough time to stop at the Culture Centre, where you can learn more about the National Park and buy local art and crafts. After about 4-hours, you will return back to your accommodation.